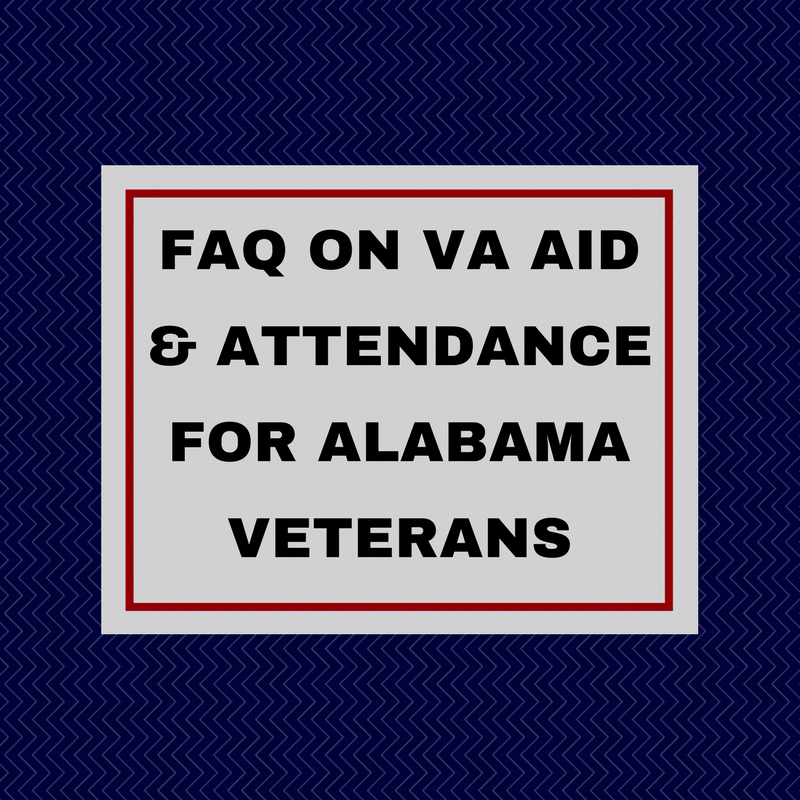 The VA Aid & Attendance (Special Pension) is a remarkable benefit for Alabama veterans and widows of veterans. There is not much known about this benefit by many veterans. Unfortunately, there are quite a few scams out there and then simply inaccurate information is constantly being repeated. So we have made this FAQ (Frequently Asked Questions) to answer as many of the questions that may be on your mind as we can think of. I’m sure we have missed a lot of questions here. However, we will add those questions as we can. Or you can put those in the comments below to help build up the knowledge and information on this page. What is the Special Pension or Aid & Attendance benefit? This benefit is for wartime veterans who need financial help in paying for long term care of various types. Care such as home care, assisted living facility care, or even nursing home care. It is a needs based benefit in a lot of ways and we’ll discuss below the requirements to meet this. What is the purpose of this benefit? These are the things we can do on our own when we are in full health. Dressing, bathing, going to the bathroom, driving ourselves, and generally being able to stay safe in our home without any help. This is where the “Aid and Attendance” comes from – we need others to help us, to “aid” us, and to “attend” to us, in order to carry out our daily lives. Here’s the best way I know to describe the practical purpose of this benefit. The purpose is to slow down, or better yet, stop the sometimes natural decline in health that so many older veterans face that ends up leading you to a nursing home. You pay for health care services in your home or you have family provide the help to you for free. Then when that is not enough, you move into a family member’s home or you move into assisted living if you can afford it – if not, you go into a nursing home on Alabama Medicaid. After you are in an assisted living facility, when the money runs out, the final destination is a nursing home with Alabama Medicaid paying for it. This means if you are living at home, the benefit may allow you to get increased help from professionals or your family so you can stay at home. Even if you have to leave your home, this benefit can prolong your ability to stay in an assisted living facility. Instead of having to go to a nursing home because you cannot afford the care you need. How much is this benefit every month and every year? For a married veteran, the yearly amount is from $16,902 to $25,525. When looking at a single veteran, the benefit ranges from $12,907 to $21,531 a year. For a surviving spouse of a war time veteran, the benefit ranges from $8,656 to $13,836. On all of these, if there are dependents, then the amount normally goes up $2,205 per year for each dependent. What are the qualifications I need to have to receive this benefit? We’ll talk about each of these. So what are the “Service Requirements” I must meet? The service requirements are the factors that must be met that have to do with what happened in your time in the service. It may also have to do with the time that your deceased spouse was in the service. Now, let’s look at the health and financial requirements. Tell me what the “Health or Disability Requirements” I must meet? Permanently and totally disabled (usually through being awarded Social Security Disability). As a practical matter, most veterans (or surviving spouses) will be 65 or older. At age 65, the VA presumes that the veteran is “disabled” in order to qualify for this benefit. (The surviving spouse does not have an age limit but as a practical matter most folks we help are over the age of 65). What are the “Financial Requirements” to receive this benefit? The income can be a bit counter-intuitive. In essence the VA reduces the benefits to which you are entitled on a dollar-for-dollar basis for every dollar of household income you have. But . . . it is only the “IVAP” or Income For VA Purposes that counts. You take the “UME” or Unreimbursed Medical Expenses and subtract that from the gross income to get the IVAP. There are strategic ways to legally and properly reduce your income — your IVAP — so you qualify for more benefits. The VA lays out the rules and, much like taking the right tax deductions, if you choose carefully you can maximize your benefits. As far as the assets/net worth test, this one is less clear because the VA has not clearly spelled out what it is looking for to qualify or disqualify an applicant. The VA is looking at life expectancy and the shortfall of income to see how long your assets will hold up before you are completely broke. If you will likely go broke before dying, then you normally meet the assets/net worth test. As of right now, there is no penalty, under the VA rules, for transferring assets of any amount before applying. Please note this is dramatically different than Alabama Medicaid rules! 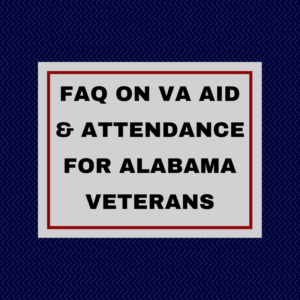 You must have excellent advice on coordinating the two sets of sometimes conflicting rules between the VA and Alabama Medicaid. It is not a situation of one set of rules being right and the other being wrong — it is a matter of you discovering what is best for your particular situation as to how to pay for long term care and that you go into any decisions you make with full knowledge of the advantages and disadvantages. As far as transferring assets to qualify for VA benefits (Aid and Attendance), you must be careful and deliberate and make sure that you do not fall prey to the ever growing “pension poachers” that are out there preying on veterans. If you live anywhere in Alabama (or your loved one who you are calling about does), give us a call at 205-879-2447. Or you contact us through our online contact form. We will be glad to help you evaluate your options. My Father was in the military during world war II. He is from Alabama.I saw your you tube on aid and attendance for widows of veterans. Was wondering if you can help me since they are from Alabama or do I have to apply in my state of Montana? Thank you! Thanks for your comment/question — if he lives in Montana then that would be the best place to look for a lawyer to help him. If you need any referrals, let me know. Do you have a family, elder law attorney referral for Lawrenceville, Georgia. Call Davis Nelson — he’s in Atlanta but helps people all over the state. PS — tell him I sent you — he’s a great guy.